If you were looking for a particular type of KNX server or gateway, there was so much choice at Light + Building 2018 that it is impractical to cover it all here. As expected, there were plenty of dedicated gateways for protocols such as DALI, ModBus, BACnet etc, but there was also a great choice of products that provide gateways to multiple open and proprietary protocols. HDL showcased the IntelliCenter server that allows you to connect KNX systems with Sonos, Philips Hue, Apple TV and many other technologies. Promoted as a super gateway, it supports KNX and HDL’s proprietary protocol and works as a KNX IP gateway, an HDL Buspro gateway, and a gateway between the two. It comes with the free-license iRidium i3 lite app which is able to incorporate hundreds of standalone smart home products and technologies into a KNX system thanks to downloadable modules or drivers including Z-wave, DoorBird, Sonos, Philips Hue, SmartThings, HomeKit and more. 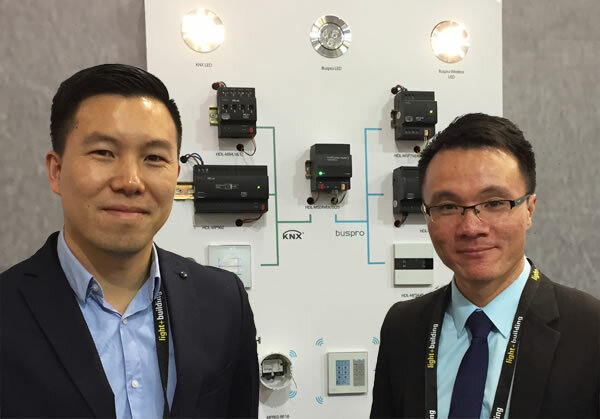 HDL’s Lawrence Jiang (left) and Ben Young (right) presenting the HDL IntelliCenter. DigitalSTROM had an impressive demonstration of assisted living techniques. DigitalSTROM offers a powerline and IP control platform, and has launched a gateway that allows KNX IP devices such as pushbuttons and sensors to be connected. The aim is to allow integration with consumer electronics, so, for example, a KNX pushbutton could control a Siemens coffee machine or a height-adjustable sink. The demo also included controllable lights, music and an under-shelf camera that can detect what type of objects are being proffered, such as an apple. 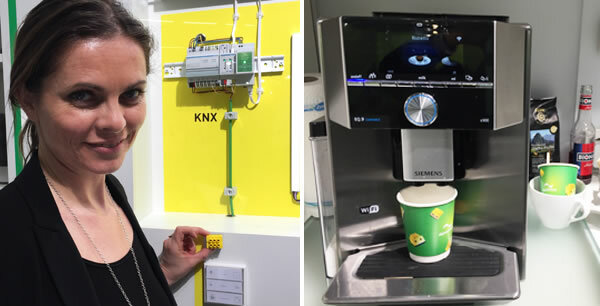 (Left) DigitalSTROM’s Katrin Witt holding the gateway that connects KNX to the powerline platform, and allows it to control consumer electronics such as (right) a Siemens coffee machine. Wiregate was demonstrating the Timberwolf Server 2600 multibus gateway. Designed as a robust and powerful server for the smart home or smart office, it can log bus traffic and permanently record individual data, with multi-directional exchange between the connected bus systems and data protocols. 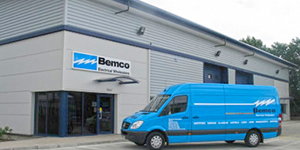 The pre-installed software can be used for data logging troubleshooting, analysis, visualisation, monitoring etc. From the summer of 2018, ETS Inside will be pre-installed, which will allow you to configure the Timberwolf server and another 254 devices via smartphone and the ETS Inside app. 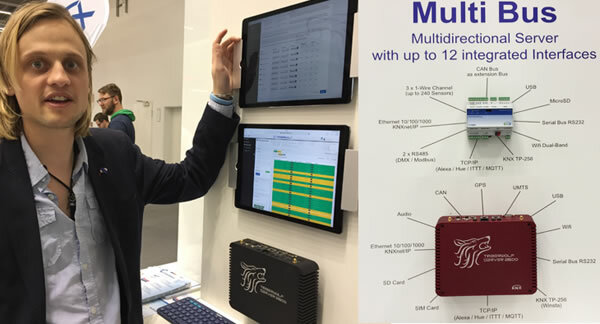 Wiregate’s Julian Zibis demonstrating the Timberwolf Server 23600 multibus gateway. 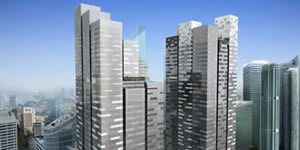 A growing number of companies are providing ways of bringing audio and video under KNX control. Basalte for example, was showing Basalte Home, its new KNX visualisation app for iOS and Android, that takes advantage of the Basalte Core server. Basalte Home supports visualisation, a logical engine, custom notifications and interfacing with Amazon Alexa and Philips Hue. It integrates music with control of lights, shades, scenes, HVAC, cameras and more, and also integrates with the new Basalte Ellie OLED touchpanel, which is just 1cm deep when installed. Also on show were Aalto active speakers that can be used with the Basalte Asano KNX multiroom audio system, and are available in many different finishes. 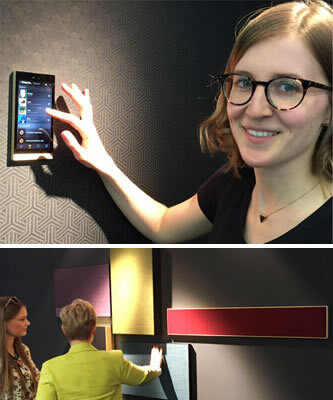 (Top) Basalte’s Fien Ackerman demonstrating Basalte Home on the Ellie touchpanel, and (bottom) the new Basalte Aalto customisable speaker range including sound bar. Thinknx has a new graphical user interface for Audiofy, that allows the volume to be controlled for all zones and groups of zones, and playlists to be created and mixed with Spotify content. A new expansion module is also available for 32 stereo zones, although each stereo signal can be split into 2 x mono with individual volume control of each. The new user interface for Audiofy. Zennio was showing the new AudioInRoom device. 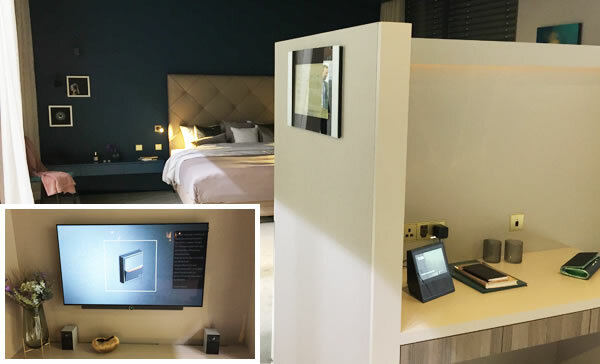 Designed for hotel rooms, this allows guests to play music from their own smartphone through a password-protected Bluetooth connection or from an auxiliary audio input such as a TV. It has two 20W stereo channels, and supports enable/disable, mute- or volume-adjust in two independent areas. The Zennio AudioInRoom allows hotel guests to play audio from their smartphone via Bluetooth. It’s not just audio that’s getting attention. 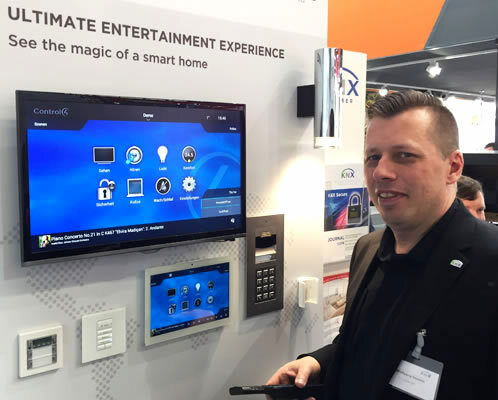 On the Gira and ISE stands was the new Loewe TV that can integrate with KNX thanks to the ISE Smart Connect KNX Loewe interface. This means that the TV can connect with KNX pushbuttons and be integrated into scenes so that, for example, as the TV is switched on in the evening, the blinds darken and a lighting mood is activated, or the TV is switched off when you leave home. 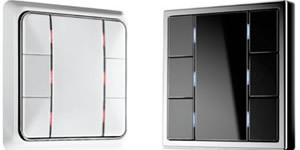 in addition, door entry images can be displayed on the TV, as well as notifications, such as ‘washing machine ready’ or ‘the front doorbell is ringing’. 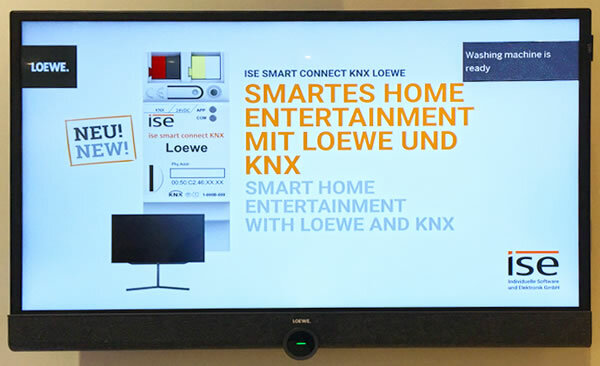 The ISE Smart Connect KNX Loewe interface allows Loewe TVs to be integrated with KNX. 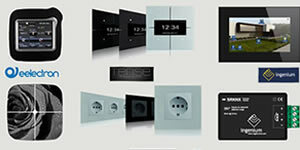 The KNX Loewe interface also featured in an impressive mock-up of an automated hotel room by Jung. This included access control, interactive TV and multiroom audio, various controllers with customisable features and the ability to control lighting/shading scenes by touch or voice. The hotel room was a cooperative effort with a wide range of partners including Assa Abloy, Silent Gliss, Revox, Wieland, Siedle, Warema, Brumberg and Loewe. The Jung automated hotel room. Part 1: IoT, Home Automation, HVAC, Water Management, Lighting and Shading. Part 2: Simpler Design, Installation and Control. 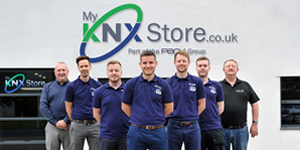 Part 3: KNX Servers, Gateways and AV. Part 4: KNX User Interfaces and Sensors.